OK, I get it, not all you plastic modelers are diecast nuts like me. 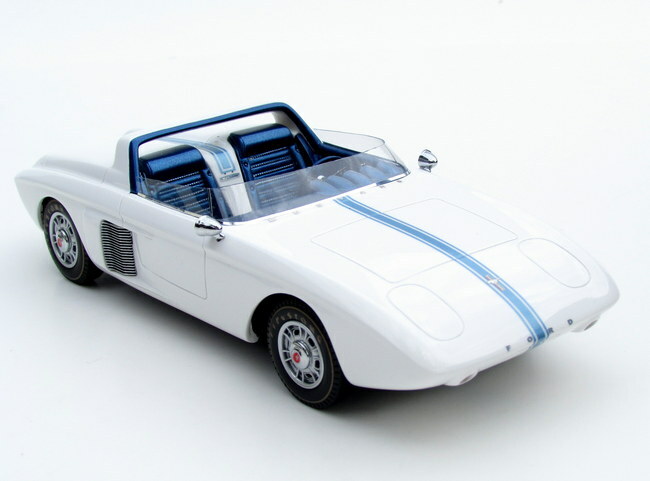 But how about a resin Mustang I Concept car, and in 1:24 scale no less. That’s what the folks over at Automodello have cranked out for you, and only a limited number will be made – 499 to be exact. There’s also a limited run 1:43 model too. But let’s get to the history and the model here. 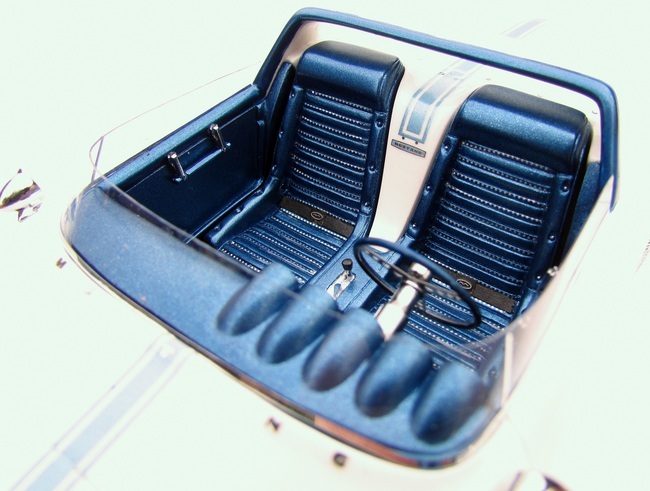 Sports and sporty cars had been the rage throughout the 1950s among the racing set. Chevrolet had responded with its Corvette and Ford went a bit more luxury touring oriented with its Thunderbird. Next up was Chevrolet’s lower cost sports coupe, the Corvair, with its rear-mounted engine. Ford needed an answer. So in 1962 Ford tried something different, an open 2-seater that was quick and light and independently sprung at all four wheels. Ford’s new baby was the Mustang I, a concept that noted Formula 1 racer Dan Gurney showed off during an F1 race weekend at Watkins Glen (N.Y.) in October of 1962, setting times that were nearly competitive with the open-wheeled racers running in that weekend’s F1 race. The white hand-hammered aluminum bodied concept car was petite, with a 90-inch wheelbase, an 89-horse V4 and tipping the scales at just 1,148 lbs. and with a top speed of 100 mph. Folks at the Watkins Glen race weekend were eager to get their hands on the car. But in its concept design, the Mustang was not to be. However, two years later the iconic Mustang sports coupe would debut, also in New York, this time at the World’s Fair. The historic Mustang I Concept got the ball rolling and lent its name to what would become Ford’s iconic pony car. Now Automodello out of Buffalo Grove, Ill., releases a sharp 1:24 re-creation, along with a 1:43 scale model, both in finely detailed resin. The company says just 499 will be made in the larger scale, while 150 Tribute Editions are planned. Those will all be signed by Gurney, its first on-track driver, and cost $150 more. We reviewed the standard 1:24 version. Automodello nails the exterior for the rear-engined concept car. All the creases are crisp and the slim aircraft like styling is spot-on. Ford’s designers at the time said they were inspired by the sleek P-51 Mustang aircraft when they created this concept. This is a resin model, so actually feels heavier than a diecast model, and the body includes seams for where the pop-up headlights would be, the hood and trunk openings and door seams too. Plus on the sides are the air scoops that the later Mustang made famous, even though they were fake. On this there’s the scoop and a silver metal grille covering where the side-mounted radiators would be to cool the rear-mounted engine, which was a standard Ford unit used in its Germany-built cars. That grille work is repeated in the fairings around the red rear lights and there are two giant exhaust pipes exiting the rear bodywork. Automodello creates the raised letters that spell out Ford on the nose and Mustang just in front of the thin windscreen that encircles the dark metallic blue cockpit. I like the galloping Mustang logos on the front quarter panels, which were also used on later Mustangs. Harder to see are the hubcaps with a red center, again featuring the Mustang logo. Tires are properly gold striped with gold Firestone logos on them, just as on the concept car and there are twin chrome side mirrors. The interior looks good too with the then contemporary straight bar door pulls, a three-spoke metal-hubbed racing steering wheel and five round cockpit gauges spread across the driver’s side dash. There’s a red fire extinguisher on the passenger’s side floor and the seats are a nice blue and silver rendition of the originals. Only one small replication issue that I noticed, the front running lights are red here, but appear to be amber in all the photos I’ve seen of the original car. I also wish that at least the pop-up lights worked, or that we could open the rear bonnet to reveal the small Ford engine. This model is well executed and rare as only two were made in the real car world. Being in the popular 1:24 scale that most plastic model car kits feature makes it all the more collectable for plastic kit builders. This will display well with your other hand-made models. Oh, and if you like to display a diecast in its own box, well this one comes in an extremely sturdy black box that really makes the Mustang I Concept look special. 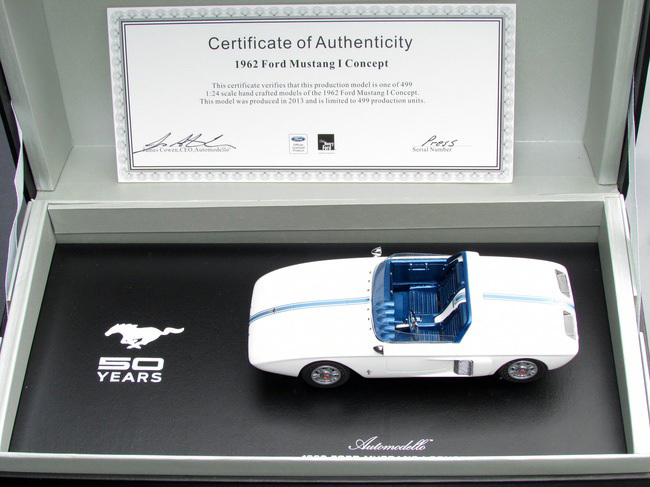 Great collection addition for you die-hard Ford and Mustang collectors, and it IS the 50th Anniversary of the Mustang, so why not fill in the collection with Mustang I?